An excellent introduction to the traditions associated with the holiday, My First Chinese New Year will be enjoyed by children aged three years and up. Highlighting traditional decorations, clothing, food, a large family dinner and a boisterous parade, colorful illustrations and text depict a family’s preparations for the special day and their joy in celebrating with family and friends. My sister and I sweep away the bad luck from last year. Now we are ready to welcome in good luck for the new year. Recommended for preschool age children, the size and format is well suited to a group storytime. 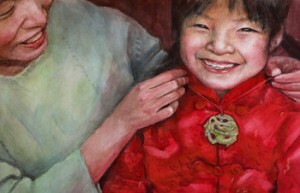 Unlike Ms. Katz’s picture book, Happy, Happy Chinese New Year will be best appreciated when read by one or two children. It could be used by a child doing research into the traditions associated with Chinese New Year. Detailed illustrations include numerous small, labelled figures preparing for a community celebration. A tremendous banquet is shown and is enhanced by a key that provides the name of each food item, in English and Chinese, as well as the significance of each of the dishes. Part of getting ready for the Chinese New Year is making sure your home is neat and clean before the new year arrives. Tidy up your house and your room. Sweep out the old and bring in the New Year! A good non fiction resource for primary grade children, this picture book offers considerable insight into the traditions associated with this holiday. When Vinson’s grandfather leaves China and arrives in America for a visit, Vinson is excited. But, from the moment his grandfather arrives, Vinson is surprised and confused. His grandfather persists in calling him “Ming Da” and he dances in the garden slowly and quietly. Vinson is familiar with kung fu and, curious about the new moves, he asks his grandfather to teach him tai chi. Vinson and his grandfather meet in the yard after school and Grandpa teaches Vinson. The young boy is impatient, he prefers kung fu’s kicks and punches. Tai chi leaves his knees tired and his arms heavy. Vinson wonders why his grandfather insists on speaking Chinese with him despite the fact that he knows how to speak English well. When Vinson’s mom says that Grandpa is going to accompany Vinson to school, he is embarrassed. He chooses to read while on the bus. He and his grandfather sit together, each stealing glances at the other. Similarly, Vinson chooses to wear his headphones rather than talk with his grandpa. It is only when Grandpa’s surprising and athletic intervention prevents a serious accident that Vinson pauses to reevaluate his perceptions. As time passes, Vinson becomes more adept at tai chi and soon Grandpa adds a new twist to their work. Vinson carries a long bamboo pole and learns the cat walk. On Chinese New Year’s Eve, Vinson’s hair is cut, the family cleans the house and enjoys a traditional meal. When Grandpa gives Vinson an embroidered red silk jacket, he asks him to wear it for the upcoming parade. Vinson is embarrassed. He worries that his friends will see him and he feels self conscious about the new jacket. As Vinson and his grandfather approach the parade route, Vinson gains appreciation for how his grandfather is regarded in the community and the tremendous pride he has for his grandson. When the two of them arrive at the start of the parade, Vinson discovers that he will be responsible for carrying a long bamboo pole, teasing the parade lions by waving a dangling cabbage. An Author’s Note at the conclusion of Crouching Tiger includes notes about tai chi and Chinese New Year as well as a small glossary. Beautifully illustrated with pen and ink as well as watercolors, readers will notice small details such as Vinson’s untied shoelace and his body language when his father cuts his hair. Crouching Tiger invites discussion about family relationships and respect for one’s heritage. In a classroom, it could be used as a Chinese New Year resource and will be particularly interesting to children who are learning about martial arts. On each two page spread there is a small illustration of a tai chi stance. Best suited to children aged five years and up. Maoman’s papa is a housebuilder. He works far from home and only returns to his family once each year. On the day he arrives home, Maoman is hesitant at first. He looks different to her. Once Papa gets his hair cut, the family makes sticky rice balls and it is time for Maoman to snuggle into bed with her parents. As firecrackers explode nearby, Maoman drifts off to sleep, The following day, the family enjoys eating their rice balls together. They leave their home and go to visit friends. Maoman discovers that her friends are also outside and visiting. As Chinese New Year unfolds, Maoman sees a dragon dance and she plays outside in the snow with her friends. When she discovers her fortune coin is missing, she is devastated. Fortunately, the coin is not lost in the snow. Maoman finds it in her jacket and uses it to establish a lovely, heartwarming family tradition. Beautiful illustrations lovingly depict Maoman’s family, her home and community. References to sticky rice balls, hair cuts, new clothes, firecrackers, a fortune coin, house repairs, a red envelope and a dragon dance provide all sorts of information about traditions associated with Chinese New Year. 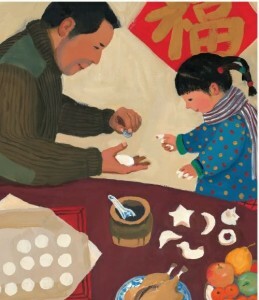 A New Year’s Reunion was awarded a Best Illustrated Children’s Book Award by The New York Times Book Review in 2011 and it won the Feng ZiKai Chinese Children’s Picture Book Award. Beautiful, warm illustrations accompany a gentle, heart-warming story in A Gift . Chinese New Year is usually spent with friends and family but, for Amy’s mom, it is a time to feel homesick. Her brothers and sister live in far away China. When a package arrives from China for Amy, she and her mom are excited to open it and read the accompanying letter. The letter explains that, while working in a field, Amy’s uncle found a beautiful stone. Amy’s Uncle Zhong subsequently took the stone to his brother, her Uncle Ming, who spent many days carving and polishing the stone until his work revealed a lovely dragon. The carved dragon, a symbol of China, will be worn by Amy on a red string necklace, symbolizing luck. Readers will note the contrast between Amy’s western-style family home and her uncles’ rural, Chinese experience. Many important details including an orange tree and a rice cooker in the kitchen, a Buddha statue in the garden, Chinese characters on a wall, sampans in a river, a water buffalo pulling a plow and Amy’s traditional costume will be observed by children and could be explored further. Best for children aged four to eight. 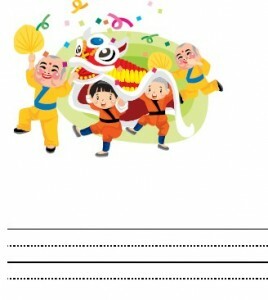 Chinese New Year theme interlined paper for beginning writers.